Apple remains a key investment for many, but the stock is also a popular trading vehicle. Here's how to trade it using charts and trading levels. A month after becoming a component of the Dow Jones Industrial Average (INDU , Apple (AAPL - Get Report) set its all-time high of $134.54 on April 28, 2015. Since then, the stock has been trading sideways to down and is still in bear market territory. 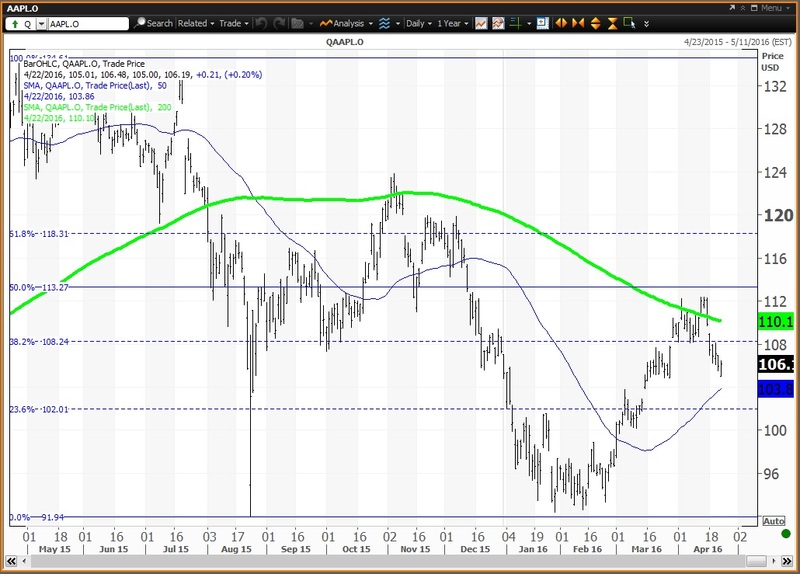 But at its 2016 low of $92.39, set on Jan. 28, Apple held its 200-week simple moving average, then at $91.76. TheStreet's Jim Cramer remarked on Tuesday that "I see a lot of people really concerned about Apple .... All I can say is, look, if you want to sell something at 9 times earnings, be my guest. I don't want you in the stock." Here's how investors should make decisions about buying, holding or selling Apple stock. The company was scheduled to report earnings after the closing bell on Monday, April 25, but that's been postponed to Tuesday, April 26, due to a memorial service for a former company executive. The company is expected to earn $1.97 a share. Investors who have an eye on shares of Tampa Bay, Fla.-based Jabil Circuit (JBL - Get Report) were aware of a warning issued on March 17. Jabil reported that 24% of its total revenue came from Apple in the latest quarter. The analyst from Pacific Crest Securities warned that "Jabil Circuit's weak fiscal Q3 (May) guidance supports our view that current iPhone demand is relatively soft." Investors ignored this warning, and shares of Apple traded to a 2016 high of $112.39 on April 14. Let's look at the charts to see how investors should decide what to do. Here's the daily chart for Apple. Apple opened Friday at $105.01 after closing Thursday at $105.88. It is up just 0.3% year to date, but up 14.6% from its Jan. 28 low of $92.39. Even so, the stock is in bear market territory, 21.3% below the all-time high set on April 28, 2015. The horizontal lines are the Fibonacci Retracement from the all-time high to the Aug. 24 flash-crash low of $92.00. At its 2016 high of $112.39, set on April 14, the stock was between its 200-day simple moving average (in green) of $110.65 and below its 50% retracement of $113.27 -- now a zone of resistance. The stock is between its 23.6% retracement of $102.01 and its 38.2% retracement of $108.24, with its 50-day simple moving average (in blue) at $103.86. The weekly chart will end the week positive if the stock closes above its key weekly moving average of $105.83. The 200-week simple moving average of $92.96 remains a key chart support. 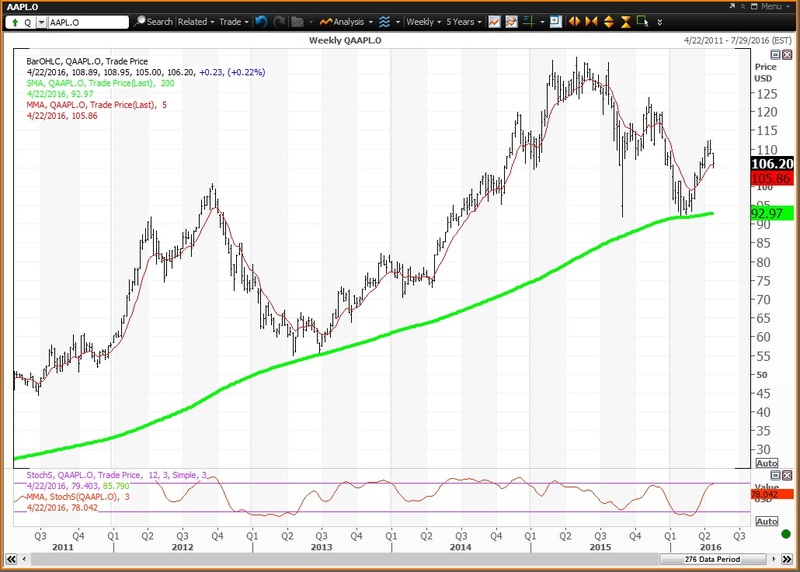 Apple has been above its 200-week SMA since the week of April 10, 2009, when the average was $14.89. The weekly momentum reading is projected to rise to 77.94 this week, up from 77.36 on April 15. Investors looking to buy shares of Apple should consider doing so on weakness to $96.06, which is a key level on technical charts until the end of April. Key levels of $104.75 and $110.22 have been magnets so far in 2016. The first expires at the end of June, while the second is in play all year. Investors looking to reduce holdings should consider selling strength to $115.54, which is a key level on technical charts until the end of next week.